Also, coming soon, a page for more advanced free motion stitching ideas! If you want to know when new projects are added, 'like' my On The Trail Creations Facebook page. The projects on this page are all free, but my kits and patterns are also a fairly low investment way of trying a new technique. With kits there is no waste of materials or time spent choosing fabrics. 1. Many free motion quilting designs are meant to not have the stitches overlap. But when you are just practicing, it can be easier to start on designs that DO overlap. 2. Some of the ideas in these projects are not necessarily things you would do on a real quilt, such as a lot of dense stitching. (Unless it's an art quilt, of course! )They are intended more as a way for you to make friends with your free motion foot. 4. Remember that free motion stitching generally shows less than you think. I like to use prints, batiks and hand dyes, all of which are notorious for hiding the stitching. But if you are learning, this can be a good thing. I spend more time trying to get mine to show up! A true solid fabric with contrasting thread is the best way if you DO want it to show. But even hand dyes that are mostly solid have enough going on to make most stitching disappear. This should help make you less nervous to quilt a real quilt! Top fabric: This can be any cotton quilting fabric. If you want your stitches to show, then a true solid is best. If you don't really want them to show, use a print and coordinating thread. Batting: This can be any thinner batting, or fusible fleece would work too. 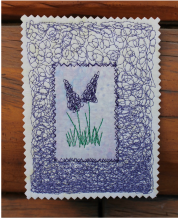 Heavy interfacing like Timtex or Pelltex works great too, and is recommended for projects with heavy stitching, like the Grape Hyacinth postcard. It is the easiest to use for most of these projects because of its stability, but not always something everyone has on hand. Backing fabric: Necessary for stability if you use regular batting, but not the heavy interfacing. I often use muslin for a backing while I am doing the stitching, then cover it with nicer fabric afterwards. This can either be attached with the binding, or fused to the back, since these are such small projects. Thread: Experiment with different types, just make sure your needle size is right for your thread thickness. Needles: Quilting, Microtex, or Topstitching needles all work for free motion stitching. Universal would be ok, but not best. Fusible web: some of these, but not all, use fusible web for some parts, the kind with paper backing is easiest to use. I'm not actually sure what these are, coasters, postcards, or wall art! Just a very quick project! Click on photo for tutorial. Click the photo for the steps to make this project. ​To make this quick sampler, just trace shapes found around your house, plates and boxes, and overlap them a bit. (Or design it on the computer) Then fill each shape with a different color and tree motion design. I used rainbow colors in order for the shapes, then a variegated one for the background. I stitched the outlines twice so they would show up better. You could finish it with either binding or a pillowcase finish like I did. There is no tutorial for this one, just the idea. It came from Barbie Toman, who is in an art quilt Facebook group, and used with her permission. She is making them to attach to all of her wedding favors, I love this idea!